Super Hero Boy: Find the ultimate gift for kids at Maukilo!! Find the ultimate gift for kids at Maukilo!! Maukilo is easily in my top five favorite online toy stores of all time. If I won the lottery I'd easily spend days browsing their catalog looking for those special toys to bring home. I wont even lie I do that now just drooling over the selection. They are especially great if you value toys who inspire creativity and will last a lifetime. Maukilo offers a huge selection of amazingly gorgeous wooden toys, knit dolls, arts and crafts, a super cool selection of ride on toys, not to mention a ton of others. We recently received a BlaBla Basil Bunny MINI Knit Doll which was absolutely the perfect stocking stuffer for Dylan. Connor received his first BlaBla doll on his first Christmas and it's been that one special stuffed animal which no matter what his current "like" is I always find Spot curled up somewhere on Connor's bed. So soft and huggable these knit plush age well and actually get softer and softer. We've washed Connor's several times as well, though I do highly recommend you air dry them just to protect them. I can't wait to give Dylan his Basil and I love the mini size for babies as they are just the right size for infants and toddlers to hold and snuggle with. If your looking for an affordable and long lasting toy for a child on your Christmas list any of the Haba block sets are a great investment. 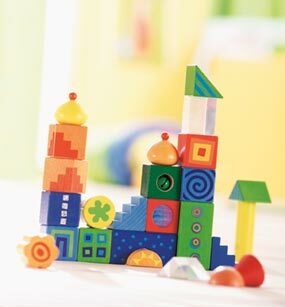 Our very first wooden toy, as well as one of the most beloved toys in the house, is our Haba Fantasy Blocks set. Everyone that sees them has to touch them and explore all their different sides and textures. Even Dylan can't keep his hands off of them!! It's also the one toy I most enjoy playing with my boys, as the colors and unusual shapes makes building with them always new and exciting. When people ask me what to buy for baby showers or birthdays they are the one toy I recommend most often. They are just one of those toys your kids will enjoy at one as well as ten! I think you will be very pleased with the selection of toys at Maukilo and the selection of drool worthy toys is fun to browse. Check them out on the Maukilo website!! Maukilo was generous enough to give us a $25 gift certificate for one lucky winner! Leave a comment on this post. Just check out the Maukilo website and let us know what toy you'd most like to get for someone on your holiday list! Subscribe to my mailing list/RSS feed and earn another entry! Let people know about the giveaway on Twitter with a link to the giveaway! BONUS - I'm allowing a fifth entry for a limited time for those of you who have previously blogged/linked to us in exchange for an entry. Update all the links you have on your site going to our old url (sevendogs) to superheroboy.com and get a extra entry. All you have to do is replace superheroboy in the link where sevendogsandababy appears. This contest will end December 15th at midnight! Disclosure: I was given a Basil Knit Bunny for review, we were not compensated for this post in any other way. My opinions and comments on items we review are always my own and are never influenced by sponsors. Might not sound fun for a present but I want to get the Clever Bear Learns to Count Learning Game for my son and daughter. I would choose a blabla doll Verde the Monkey! I'd like to get a Marrakesh Room Tent. I would love to get my daughter the HABA baby pram. It's soooo cute. The Prudence girl owl knit doll is so cute! My daughter would love her. I would love to get my niece the HABA Ghost Hunters Game. She would have so much fun with it. Thanks for the giveaway! I would like the Giant puzzle -Pony Stud. I would get the Pirate Joe. I think the Marrakesh Room Tent is awesome! I love the Castle Creative Cardboard Toy (Large). How freaking awesome and cute are these Rody Hop-ons? I’d get the Terry Train Pulling Train for my little nephew, so adorable!